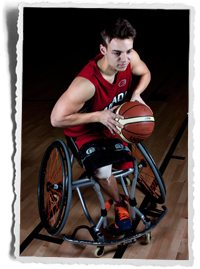 (Adana, Turkey) Two Canadian wheelchair basketball players were among the six preeminent talents who stood out amongst a dozen teams that competed at the 2013 Men’s U23 World Wheelchair Basketball Championship. Nik Goncin, of Regina, Sask. was named the tournament’s most valuable player and Vincent Dallaire, of Quebec, Que was one of five player named to the all-star team, as voted on by their peers and tournament organizers. Canada was the only country to have two players recognized for their outstanding performances even though they finished with a 3-5 record and placed sixth in the tournament that wrapped up September 14 in Adana, Turkey. Goncin averaged 24.0 points per game and 12.9 rebounds per game to lead Canada. He tallied a total of 192 points and 103 rebounds in eight games. “I definitely did not expect to get tournament MVP as there were a ton of young talented athletes other than myself on teams that medalled,” said Goncin. “I feel honoured to receive the award, especially since our team finished sixth in the tournament. Both Vince and I must have made a pretty great impression. This is the most distinguished award I have received so far playing wheelchair basketball and it really means a lot to me,” said Goncin. 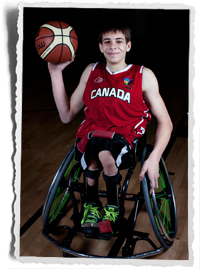 Goncin began playing wheelchair basketball in 2008 and first represented Canada on the international stage at the 2009 Men’s U23 World Championship placing eighth. He currently is on an athletic scholarship at the University of Illinois, where he competes for the men’s collegiate wheelchair basketball team. Dallaire, who began playing wheelchair basketball in 2002 and grew up playing with recreational and competitive club teams in his native Quebec, averaged 7.4 points per game and 3.0 rebounds per game with a total of 59 points and 24 rebounds in eight games. He is one of three Canadian players that are eligible to play in the next tournament in 2017. Jens Albrecht, of Germany, Joakim Lindblom, of Sweden, Moreteza Ebrahimi, of Iran, and Harrison Brown, of Great Britain were also named to the all-star team.